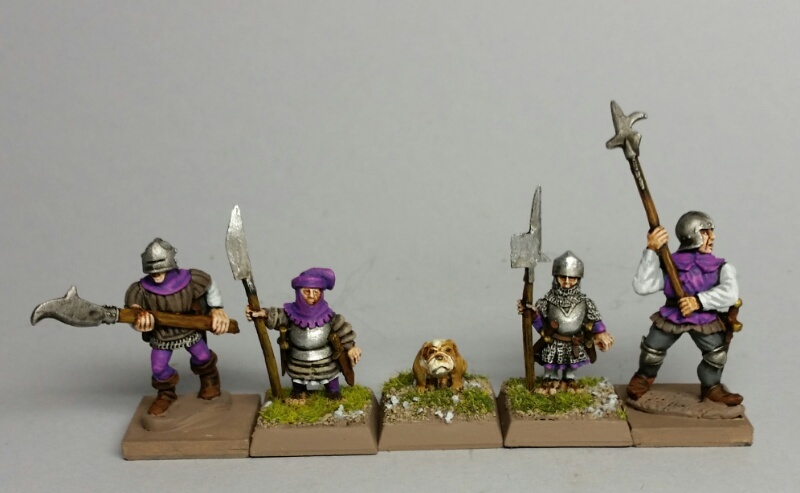 On the ends are a couple of test figures for an upcoming unit (or two) of human halberdiers. When hobbits settled in the Little Country, there were already humans living there. The newcomers formed their own communities, as well as joining existing communities of the "tall folk." For the most part, the humans of the region found that they had more in common with the "little folk" than they had with their nominal governors bustling Marienburg, nor their neighbors in Bretonnia & the Empire, and the region has benefited. I believe the figure to the left is from a a Grenadier "Fighting Men" pack (now sold by Mirliton), and the gent on the right is from Front Rank. As previously mentioned, the hobbits are from Westfalia, and the dog has been confirmed as a (former) Mega Mini figure, now sold by Turnkey Miniatures. Looking good! Crossbows make sense for Halflings - more punch for their size.